Last Sunday I was invited to participate in the anniversary edition of The SibeVibe on Dog Work’s Radio. It was a very special show not only because Dorothy of the FiveSibes fame was celebrating a two year anniversary of being on air, but also it was a show to highlight the National Holistic Pet Day that falls on August 30th, and as such, I wanted to take this opportunity to share the recorded interview on the blog. If you are more of a reading rather than listening type (I know I am! ), I am also including a transcript of the show; it’s not verbatim, so you still might want to have a listen. Enjoy! This month we are recognizing National Holistic Pet Day, which is held on August 30th, by featuring small animal massage and Reiki practitioner Marta Banat of Vancouver, British Columbia. 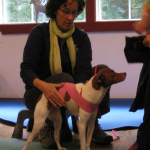 Marta is the founder and owner of All Paws Massage, a service providing massage and Reiki to companion animals. Marta says she first learned about the benefits of massage and energy work while searching for holistic approaches to manage her dog’s Epilepsy. 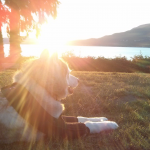 Marta’s Epi-dog is a Siberian Husky named “Rocco,” and his improvement through this type of treatment inspired Marta to train at NorthWest School of Animal Massage and open her own practice to help other pet parents. A little about Rocco – he is a 5.5 year old Siberian Husky who Marta says is a sweet, happy-go-lucky boy who loves adventures. He came to her at 11 months with a number of health problems. At three years old he was diagnosed with Idiopathic Epilepsy, but she notes, the diagnosis did not dampen his love of life. Through careful management and holistic approaches, they were able to get seizures under control. She is happy to report that it has been six months and counting since his last seizure. And Rocco loves life…his favorite activities are swimming, hiking, and road trips. He is also one of the featured stars in my upcoming book on Canine Epilepsy titled EPIc Dog Tales: Heartfelt Stories About Amazing Dogs Living & Loving Life With Canine Epilepsy through ArcticHouse Publishing this fall. Also as part of our “The Sibe Vibe” special 2nd Anniversary show, and in conjunction with Holistic Pet Day, we are featuring a special “Get Your Dog Healthy With Natural Treats” Giveaway sponsored by House Woof Natural Dog Treats located in Vermont. You can check out their online store and the history of their naturally Vermont-baked treats by visiting http://www.housewoofdogbiscuits.com. Three lucky listeners will each receive one bag of either their “Vermont Apple Crisp Stix,” “Pawnut-Butters,” or “Gibbie Snacks” formulated for the Canine Epileptic and named after my very own Epi-Husky Gibson of the FiveSibes. As an added treat, I will be including a purple “Live Gib Strong” K-9 Epilepsy Awareness bracelet to each prize. To be eligible to enter the Giveaway, they can visit my blog post today at www.FiveSibes.blogspot.com, and just follow the Rafflecopter directions to enter the random giveaway, which will end at 12 AM on August 26th. One of the questions asked on the Rafflecopter we will give the answer to somewhere during this hour, so be sure to listen in carefully! Hello, Marta, and welcome to our show! Q: In the opening, I talked about how your own dog, Rocco, a beautiful Siberian Husky, has Canine Epilepsy and you sought out massage as one of his treatments. Can you take us back to the beginning and tell us first about when Rocco first was diagnosed, why and how you chose massage as a treatment? A: Rocco was first diagnosed at 3 years old, he would have seizures about once a month and together with our vet we decided that unless the seizures become more frequent we will try to manage his epilepsy without the use of pharmaceuticals. But I felt like I didn’t want to just sit and wait to see “what happens”, I wanted to do something. So I spent a lot of time researching things that people have done for their epileptic dogs. Massage was one of them. At that point it was just something to try. Q: How did he respond to the treatments and how soon did you see benefits from it? A: I first tried massage after a seizure. Since it’s a traumatic event for the body that often results in misalignments and tense, painful muscles, I saw the results right away. It loosened up his body, but also was a great tool to keep him calm and present in his own body, which helped speed up his post seizure recovery. As a maintenance routine, massage helps to keep him relaxed allows to tap into the parasympathetic nervous system that is responsible for relaxation. Q: Was, or is, Rocco on any medications or treatments in addition to the massage? A: Yes, he was treated with homeopathic medicine, had chiropractic adjustments and takes supplements such as zinc and milk thistle, I also feed him four times a day to make sure that his blood sugar levels remain stable. Q: How exactly did Rocco inspire you to pursue a career as a practitioner? A: Working with him, I saw how much he enjoyed our sessions and I could see how much they benefited him. It encouraged me to learn more and research massage further and by the time I knew it, I was enrolled in a massage program! I’m such a big proponent of incorporating holistic and/or homeopathic treatments with the care of my own Sibes. With Gibson, who as many of listeners know, is an Epi-dog having been diagnosed five years ago when he was three also with Idiopathic Epilepsy, and he is my inspiration behind my “Live Gib Strong K-9 Epilepsy Awareness Campaign” to help get the word out that dogs with epilepsy can –and do—live happy full lives. While he is on anti-seizure and thyroid medications, I also incorporate natural supplements, massage, and cold laser treatments to help him fight off the side effects of his meds, as well as help strengthen his immune system. A: massage as a preventative or maintenance approach helps by relieving muscular tension and decreasing muscle fatigue and soreness, this is a big part of injury prevention. Massage will also assists in flushing out toxins from the body and facilitating the intake of nutrients. It improves breathing patterns, especially for breeds prone to breathing problems. Also, massage will improve the condition of skin and coat. As a result of these benefits massage will help to maintain your pets overall health and well-being. 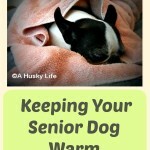 Q: You also mention that massage is beneficial for senior animals as part of an effort to slow down or relieve age-related symptoms. Can you tell us about some of those symptoms that massage can help? A: It can improve fluid circulation, help lubricate joins, relieve stiffness, aches and pains, improve muscle tone, assist in preventing or slow down muscle atrophy, help maintain or even improve range of motion, boost immune system and improve vitality. For those of you just tuning in, this is “The Sibe Vibe” on Dog Works Radio and we are highlighting National Holistic Pet Day (which is August 30th) by chatting with small animal massage and Reiki practitioner Marta Banat, who also owns the All Paws Massage in Vancouver, British Columbia. She is also the mom to Epi-Husky “Rocco” who she treats with massage. You can follow Marta’s community page of the same name – All Paws Massage – on Facebook, and also check out her website at: http://www.allpawsmassage.ca. I will also be sharing her info on my FiveSibes blog at http://FiveSibes.blogspot.com, on our FiveSibes: Siberian Husky K9 News & Reviews Facebook page, and on DogWorksRadio.com under “The FiveSibes” show tab. Okay – to enter our special 2nd Anniversary “Get Your Dog Healthy With Natural Treats” Giveaway sponsored by House Woof Natural Dog Treats located in Vermont, Tell us WHO “Rocco” is and WHY or HOW did he inspire our guest Marta Banat to pursue her current profession? Hop over to our FiveSibes blog at FiveSibes.blogspot.com and look for today’s post – August 24 – and leave your comment there ~ or you can leave a comment answering the question on our FiveSibes: Siberian Husky K9 News & Reviews public community page under the pinned post about it being our 2nd Anniversary. We have a few posts, so be sure to comment on the one pinned to our page or we may not see it! The Rafflecopter will also ask you to do a few other things as well, such as follow the FiveSibes, Dog Works Radio, House Woof, and All Paws Massage. If you already follow us or any of our partners for this show, you just have to click that you already do! You have until 12 AM on August 26th to enter and remember you must answer the question “WHO is “Rocco” and WHY or HOW did he inspire Marta Banat to pursue her current profession in order to be qualified. Good luck! Q: Marta – How long is a massage session and is the dog’s parent/guardian present during the massage? A: Depending on the dog’s needs a session can be either 30min or a full hour. The parents like to be present and that is very often the case, but I also work out of a daycare and occasionally I’m given keys to do the massage while the guardian is at work. Q: How responsive are the dogs to treatments, especially the first one when it’s introduced? A: The first session is always very interesting, as all dogs react differently. Some dogs fall asleep within seconds, but there are some that have to take breaks to “think about it’ because they are confused about the new sensations in their body. And of course there are also dogs that might have tender areas and are more guarded. But usually after the first session they really understand that this is something that is meant to help them as they do feel relief, so the second session is usually a breeze. Q: How long before the dog feels the benefit from it? Is it immediate? A: It depends on the dog of course, but usually there is at least some immediate relief if only with tense areas. Also the feeling of deep relaxation is extremely rewarding for the dog. Q: How often do you suggest a dog receive a treatment? A: Again, it all depends if this is a maintenance program or if it’s a rehab case referred by the vet. It can vary anywhere from once a week, bi-weekly or once a month. In extreme cases it may even be twice a week. Q: Are there techniques that after they leave you, that should be continued at home in between treatments to help the healing? A: Yes, I often leave pet parents with homework or tips for gentle and very easy strokes that they can apply at home. It makes a huge difference if they are able to take an active role and follow up with my recommendations on as often as possible. Q: Can you tell us about the ancient Japanese form of healing called Reiki? I’ve always been intrigued by Reiki, which is supposed to help with pain and discomfort and wondered just how do these type of treatments work? A: Reiki is an ancient Japanese form of gentle and non-invasive energy healing, which is based on the premise that universal life energy is present. This healing energy is channeled through the practitioner’s hands to support the self-healing processes of a being that may be blocked for a variety of reasons. Q: I’ve also heard from a fellow canine parent that one of their dogs is receiving Reiki treatments for food aggression and body posture issues, and they have seen positive effects. How is that Reiki can help with these types of issues as well, and what else can it be used to treat? A: Reiki balances not only the body, but also the mind, spirit and emotions. As such it is a very effective tool in treating many behavioural problems which can be caused by problems in the emotional level. It is also a great tool to help with anxiety and achieve deep relaxation, all leading to a more stable temperament. Body posture issues, if not caused by a physical problem, can often be a symptom of emotional problems, as we often see in people. Reiki then can help with be it fear, insecurity or anxiety that are cause the animal to take on a “protective” posture. Q: I’ve heard that Reiki treatments can be performed not just in person, but also long distance, via phone, etc, as it has to do with healing energies from the universe. Is that true and how does that work? A: Yes, that is correct. The most important aspect of Reiki healing is the intention and the openness of the recipient. The universal energy that makes up everything knows no boundaries, time or distance. I use a photo of the animal I’m sending Reiki to and through visualization and focused intention the energy travels to the recipient. Q: How often do you suggest Reiki is performed on a dog, and how does it work in conjunction with massage? Or does it? A: It is recommended to do four sessions within a short span of time, ideally every few days. After that the sessions may be every few week or months, all depending on the individual. Reiki works wonderfully in conjunction with massage. I find that I often channel Reiki during my session because it is such a relaxing experience for both the dog and myself. It is a meditative space that allows for healing to happen. Q: With dogs who are on medications, and they have massage and/or Reiki treatments, is there anything they need to look out for? Is the dog lethargic or sleepy afterwards? Should they rest for a bit, or can they resume their normal activities (as per their veterinarian)? A: With dogs or cats on any form of medication I always ask that the vet gives the guardian a “go ahead” for the session. Once the animal is cleared by the veterinarian, I will make sure to have the list of medication so that I know what to be mindful of, such as easier bruising, higher pain threshold or irritability. I will often research the medication or call the vet to enquire what to look out for. Reiki is such a gentle and non-invasive modality that it doesn’t pose any inherent risks. One thing to be mindful of is that after a massage session any animal, healthy or otherwise, will drink more and will often sleep more. And just another reminder that if you’d like to enter our special 2nd Anniversary random “Get Your Dog Healthy With Natural Treats” Giveaway sponsored by House Woof Natural Dog Treats located in Vermont, you need to comment on our FiveSibes Blog or FiveSibes Facebook page and tell us WHO “Rocco” is and WHY or HOW did he inspire our guest Marta Banat to pursue her current profession? Hop over to our FiveSibes blog at FiveSibes.blogspot.com and look for today’s post – August 24 – and leave your comment there ~ or you can leave a comment answering the question on our FiveSibes: Siberian Husky K9 News & Reviews public community page under the pinned post about it being our 2nd Anniversary. Marta – Today there is such a huge interest in holistic approaches to not only human health, but the health of our pets. I find that we feed them healthier and give them a more healthier lifestyle via diet and nutrition, whole health treatments, such as massage, Reiki, laser therapy, water treadmill therapy, etc. It not only helps to strengthen their limbs and body, but as we said a little earlier, also their emotional and mental health. With Gibson, last Christmas Eve he fell on a patch of ice hidden by newly fallen snow while playing with his younger sister who was, of course, having the wild snow zoomies in the yard. Gibson, who has battled weak hind issues for years as a result of his Epi-meds, which I treat with my own massage and cold laser treatments, and supplements for whole body health. The December before he had torn his right CCL, which in agreement with our vet, we elected to try and heal via Conservative Care Management/Treatment as opposed to surgery to avoid any breakthrough seizures. We used a combination of a stability leg brace for a portion of the time, and cold laser therapy. Then he had the fall this past December and not only tore the left CCL, but also hurt his already weak hind end and immediately went lame. He was in pain. He was crying and he could not move. He knew it, too. His whole demeanor and personality was, sad and depressed. As many of our followers know as I’ve posted about his progress over the months, he was once again in a stability leg brace for five weeks (until he chewed it off!) and had to be helped to walk via a sling harness to keep the weight off his legs as he could not put any on himself. He had medications at first, then I weaned him off and he was on just the natural supplements, laser therapy, and massage. It’s been a long road, but one of the first things to return was his demeanor. He once again became happy. As he had a treatment, his personality came back a little bit more, until he was in full fighting mode. I wholeheartedly believe these treatments help them mentally, as well as physically. A dog who receives no encouragement or love or positive treatment will feel that, and as a result possibly give up. Q: Marta – What is your view of how well a dog, with positive reinforcement from their guardian and therapy such as massage, can help them help themselves heal with a positive, happy mentality? And how often have you seen massage treatments affect the whole dog in this manner? A: This is a great example you just gave, and one that I often see in dogs that are under kennel rest. They are depressed, they give up, their will to heal can dwindle. But once they feel that not only they are surrounded by love and support but also that THEY are part of the team and are playing a huge role in the recovery effort they bounce back. Nurturing and supporting the self-healing abilities of the body is probably the most important part in any recovery process. Making them believe that they are a part of it can really turn things around. Q: What is the most extenuating case that you have given a treatment to, what type of animal was it, and what was the outcome? A: That’s a good question, I have to say that all my palliative cases really test me on many levels. It is no longer a question of healing, but of providing physical and emotional comfort. I think the most difficult case was of a Australian Cattle Dog that didn’t want to let go for the sake of his guardians, he was so loyal and devoted he was clinging on with a certain level of anxiety because he felt like moving on would be equal to abandoning his parents. In case we were doing Reiki sessions to emotionally help him make the transition. Q: Do you have any sage words of advice for pet owners who are seriously looking into massage or Reiki as an added or solo course of treatment for their pet? A: I think the most important thing to consider are the qualifications of the massage practitioner. In most states and in Canada it is an unregulated industry and as such the onus is on the guardian to do their homework and make sure the person the are hiring has the appropriate training and skills. Ask questions, and if ever in doubt request to see paperwork that would back up the person’s claims. Follow your gut instinct; it’s very important to find a person that feels right for you and your pet. And if ever in doubt always follow up with your veterinarian to see if this is an appropriate modality for your pet. 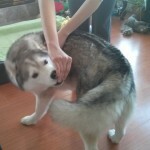 Q: Marta – you also write the blog “A Husky Life” at http://www.bitesandtales.ca/. Can you tell us about your blog and the subjects you cover over there? A: The blog started out as a photo journal of Rocco’s adventures and also some cute pictures of our two cats, Vasco and Ilyich, but with time it evolved to encompass health and training tips, product reviews, travel diaries and local recommendations. It was wonderful having you on our special 2nd Anniversary show! and being our special guest for National Holistic Pet Day! I thoroughly enjoyed chatting with you and thank you for sharing so much valuable health information. 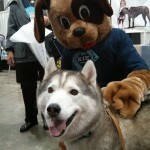 Husky hugs to Rocco!